Grey has replaced what was known as ‘basic beige’ for a few years now and that trend continues. While many may shy away from grey tones for fear they are too industrial and institutional, keep in mind that warmer grey tones can be just as cozy and inviting as their ‘beige’ counterparts, especially when paired with a complimentary warm palette. Even cooler greys can be used with warmer brown and beige tones to create an interesting contrast in a continually neutral space. Silver, bronze, gunmetal, copper, even brass and vintage gold are making a comeback! You simply can’t go wrong with accents of all things shiny and reflective. Some experts say it’s a reflection of our culture’s fascination with technology, its advances, the speed at which it is advancing and how it impacts the world of design. Regardless of why, this is a fun trend that is quite easy to incorporate into your décor. 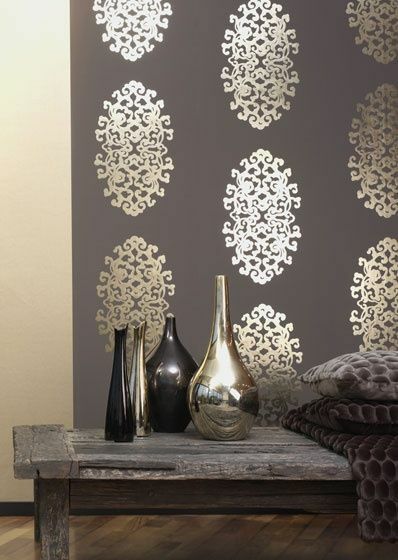 Metallic tones can now be found in fabrics, wall coverings, and rugs as well as furniture and accessories. When paired with a neutral palette, they add a touch of glamour and elegance; coupled with a more rustic vibe, metallics offer an interesting contrast. Don’t be afraid to mix metals; it can add to the layered effect of the room’s finishes, creating depth as you add some sparkle! Although it’s not for everyone, we continue to see the use of bold, dark color – even black – on walls for the ultimate impact. These ‘moody’ walls offer the perfect back drop for pops of color, contrasts of white, or the sparkle of the many metallics that are so popular right now. Surprisingly, black walls don’t close in a room as many may fear. The use of such a deep tone offers the opportunity to play with lighting selections throughout the space in order to create architectural interest and an ultimate wow factor. On the contrary, we are also seeing more brilliant white walls than ever before as designers seek to provide a crisp, clean canvas for the ‘collected’ style that so many are embracing. White walls don’t compete with surrounding finishes or furnishings and are a bright, fresh start for any interior. The key to making this work for you is to add layers of color, texture and pattern as you select the furniture and fabrics for the room. It’s impossible to talk about design trends and not mention Pantone’s infamous Color of the Year. This often anticipated announcement from Pantone (whom many refer to as the global authority on all-things color) offers a little glimpse of “what’s to come” as the selection tends to influence product development and purchasing across many facets of design. This year’s selection is “an enchanting harmony of fuchsia, purple and pink undertones” – also known as Radiant Orchid (as described by Leatrice Eiseman, executive director of the Pantone Color Institute®). Purple tones have always been associated with riches and royalty and Radiant Orchid doesn’t disappoint. This color can be easily used to accent almost any palette as it pairs beautifully with cool grey and warm golden neutrals. It’s also a fabulous compliment to a warm palette of red tones and an exciting, bold contrast to cooler blue and green tones. Whether you simply add a throw pillow, blanket or vase, or you choose to ‘go big’ with a bold, tight-backed velvet sofa or tufted ottoman, infusing your space with the season’s hottest hue is a great way to stay ‘on trend’. While it’s always fun to know what is ‘trending’ and to have splashes of the latest and greatest styles sprinkled throughout your home, the best trend to follow is YOUR style, your personality. 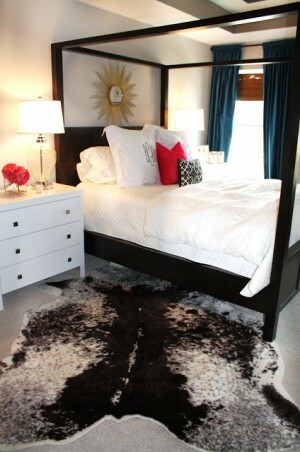 No matter how you add in touches of any trend, they should ultimately compliment your already-fabulous, personal space. – To contact the Home Stylist for a personal design consultation, email her at jodi@planitdesign.us or via facebook at www.facebook.com/Plan.ItDesignLLC.